You might’ve noticed that my family and I are not vegan eaters. But I do love having many different vegetables served on table, sometimes enjoy a no-meat day. These dumplings have got several vegetables in five different colours for fillings, and can be a perfect light lunch, or snacks for tea time. Sift flour into a large mixing bowl. Drizzle the hot water evenly into the flour in a circular motion. Use a spatula or chopsticks to quickly mix well, to create little flour crumbs. Add room-temperature water in three batches and knead into a smooth dough. Place in a greased bowl, covered with a plastic film. Let it rest for 30 minutes. To make the fillings: Heat oil in a wok or frying pan. Saute ginger over medium-high heat. Add mushrooms, carrot, dried tofu, corn kernels and chives. Stir fry until aromatic. Add vermicelli and water chestnuts. Stir in the seasonings. Set aside. Let cool down. Roll out the dough into a long tube shape. Cut into 14 to 16 equal portions. 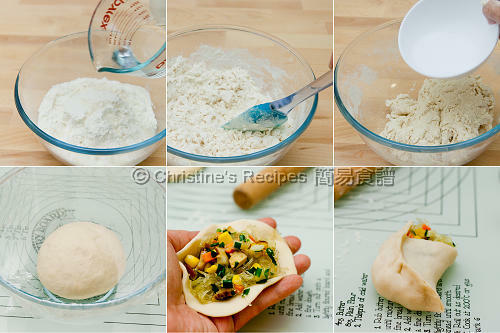 Roll each portion into a small disc with a rolling pin, each about 8cm in size. Wrap a heaped tablespoon of filling and pinch the edge. Repeat this step with the remaining pastry and fillings. Steam the dumplings in a wok or a steamer over high heat, for about 15 minutes, or until cooked through. Serve immediately. The chicken bouillon powder can be replaced with shiitake mushroom powder for vegan eaters, which is available at Asian stores. 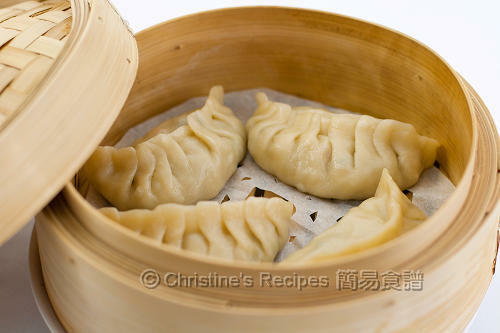 The leftover dumplings can be kept in a covered container in fridge up for 3 to 4 days. Frozen can be kept for a month. Spicy tofu is also available at Asian stores, often placed in chilling section. The texture of the dumpling skin is made from hot water and flour, produced a soft and springy feel. You might like to refer this video of how to wrap a dumpling. The pastry is very stretchy and tender, thus wrapping the diced fillings inside is quite a challenge for a beginner. It’s nothing wrong if seal tightly without pinching the edge at all. You'll make some beautiful rustic dumplings. Just make sure no fillings would leak out. Delicicous! I love the veggie filling. Been a while since I made my last batch of dumplings! Time to make some soon! These look so good and healthy! Christine...your dumplings looks delish and you did a great job on the pleats :) I can never do a perfect job on it :( Btw can the pastry recipe be used for the pan fried dumpling too ? Yes, you can make pan-fried dumplings with this pastry recipe. The skin is very soft and nice. no-meat days are fun! your dumplings look cute and delicious. I'm usually a meat eater :P but this, I can snack on! Eating and making dumplings always means happy moments to me, the Chinese name of your dumplings sounds cheerful too : ). I love vegetable dumplings especially with chives. This looks delish. yum yum! Lovely, I want to make some too! 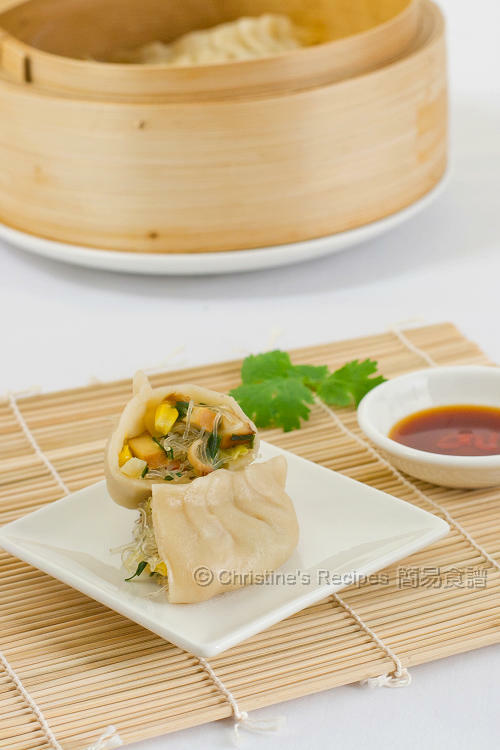 The idea of combining different veggies in a steamed dumpling is great! Love it. Very nice Christine! I will make them, soon! 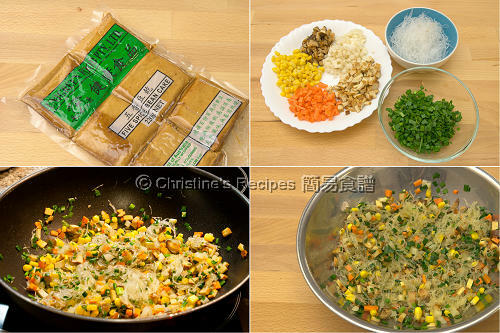 It is so nice that you are posting recipes for delicious Cantonese food! It is such a delicate and lovely cuisine that deserves recognition! Would you have any tips on how to make the dough smooth? Mine seems not too smooth... Many thanks. The dough needs to be kneaded enough so that it won't stick to your hands or your bowl. When enough gluten is generated enough through kneading, your dough will be smooth for sure.